Follow me on a recipe testing journey! Not sure whether any of you recognize this vegetable (sorry for the blurriness). My parents have an organic garden and Mama gave me a huge bag of the “Threat Vegetable”. I assume it got it’s name due to the stalk being very threadlike after cooking. Heat up the oil in a wok, toss in garlic, stir fry until fragrant, toss in dried shrimp for 1-2 minutes, add the thread vegetable, pour in lettuce heart juice, cover the wok and let it wilt for 2 minutes, stir in pickled lettuce heart, stir until all leaves are wilted. Serve over rice! 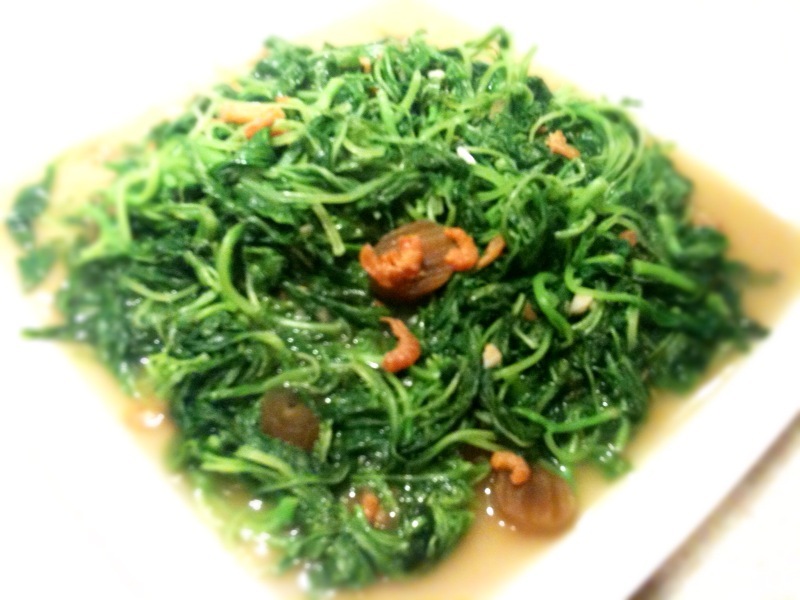 Wow this looks delicious.. I’m a big fan of Chinese greens, so I’m definitely bookmarking this! Hi Rice Palette, your comment made my day! I’ve just checked out your website, looks fabulous, will go through your recipe postings when I get a chance, the dishes look delicious!